With star quarterback Zach Collaros out for the season, backup Jeff Mathews takes the helm of the Hamilton Tiger-Cats offence and will try to keep the team's drive to the Grey Cup alive on Friday against the visiting Calgary Stampeders (7:30 p.m. ET). 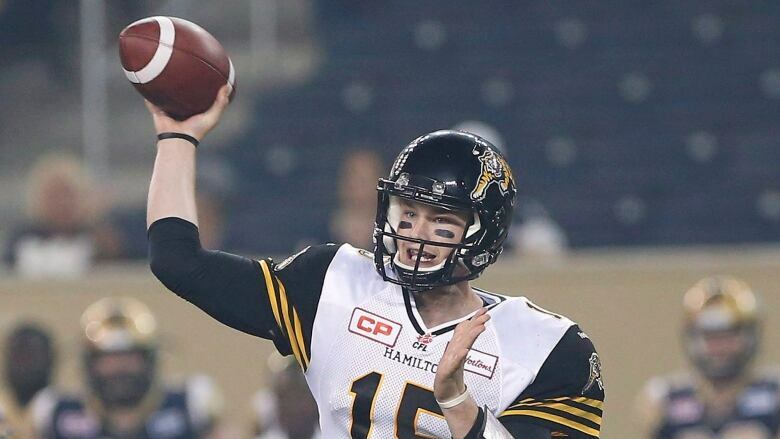 Hamilton Tiger-Cats rookie quarterback Jeff Mathews faces a daunting task in his first CFL start. Mathews leads the Ticats against the Calgary Stampeders on Friday (7:30 p.m. ET) as the top two CFL teams battle it out on in the second re-match of last year's Grey Cup final. Despite his lack of CFL experience, Mathews said he's prepared to face the defending Grey Cup champions. "I'm excited, I'm ready to go," said Mathews, 24, who played under Ticat head coach Kent Austin for three years while they were both at Cornell and understands Austin's offensive systems as well as anyone. Mathews came in for Zach Collaros in the second quarter against Edmonton two weeks ago after Collaros, the league's leading passer to that point, suffered a season-ending knee injury. It was a disastrous performance for the rookie. Mathews threw three interceptions (two returned for touchdowns and one in the end zone) to hand Edmonton the come-from-behind 25-18 win. Despite Mathews' struggles, he has Austin's confidence to be handed the start. "He's got all the qualities that we believe in, in that position," said Austin, himself a former quarterback. "He's smart. He's accurate and he's tough." Austin wouldn't bite when asked if he's tweaked the game plan with a new kid at the helm. "We have a game plan that we believe fits the skill sets of everybody on the offence," he said, before adding: "Jeff's capable of running our offence in its entirety." Mathews agreed the game plan is similar to what's been used all season. "There's some things that I do, maybe, a little differently than Zach," he said. "It's a little bit towards me but for the most part it's what we do as a team. So we're not changing too much." goal. That game was a re-match of the 2014 Grey Cup, also narrowly won by Calgary. They have the top two offences in terms of points scored per game (Hamilton 27.8, Calgary 24.8). But now only Calgary has one of the league's top quarterbacks. Bo Levi Mitchell is second in the CFL (behind Ottawa's Henry Burris) with 3,578 passing yards and third in the league with 19 TDs. All eyes will be on Mathews and whether or not he's been able to take advantage of a bye week to recover from those disastrous three quarters two weeks ago and show that he is a master of Austin's systems. The numbers don't bode well. The Ticats are only 1-6 when Collaros either doesn't start or can't finish. Plus, Calgary has won its last seven meetings against Hamilton (and 11 of 12), though this will be the Stamps first time at the new Tim Hortons Field. Calgary has the league's third and fourth-leading pass rushers with Charleston Hughes (nine sacks) and Freddie Bishop (eights sacks), though they will be missing linebacker Juwan Simpson and defensive back Joe Burnett who have been put on the six-game injured list. "You've got to play really well to beat [Calgary]," said Austin. "If you're not on top of your game against Calgary, you won't win the football game." Mathews spent last season jumping around the NFL before signing with Hamilton in the off-season. He had a great pre-season, throwing two TD passes and leading Hamilton to 20 points in the first half during a win against Ottawa. To this point in the season, he has scored five touchdowns as the short-yardage quarterback. Austin isn't worried about Mathews' mistake-riddled game against Edmonton. "Jeff knows what he did. I didn't have to belabour it. He won't make those mistakes again." Receiver Bakari Grant is back from injury, giving the Ticats offence one more weapon to go with its impressive stable of receivers. And the Ticats have re-signed running back Michael Ford this week (he was initially released in August after playing three games) whom Austin referred to as "an excellent pass protector."